Creating a virtual network of trusted colleagues with whom you can share information about social work is a valuable lifelong learning tool. Competent and ethical social work practice requires that practitioners, educators, and students stay up to date and share information about current news, practice knowledge, and the latest research findings (Council on Social Work Education, 2015; National Association of Social Workers, 2018). While there are many strategies for lifelong learning, one robust strategy is the use of a professional learning network (PLN). Simply stated, PLNs use social networks, the same strategy that social workers have used for decades to connect to people with shared interests and exchange useful information. PLNs are a well-established practice in the field of education (Richardson & Manacebelli, 2011) and are utilized across many disciplines. Giving PLNs a name and context offers an opportunity to formalize and analyze your own PLN and consider your goals related to professional learning. Social workers already use PLNs—and may not even realize it—when they collect and exchange information in a social setting, such as sharing referrals and resources with other social work colleagues. A social worker might receive e-mail alerts from online newspapers, blogs, and scholarly journals about the latest child welfare research findings, and then share this information with employees, colleagues, or students via Twitter, or maintain a curated list of readings on Instapaper, a social bookmarking tool. What makes this a PLN is the feedback loop—the social worker offers her or his insight to others who can then offer their own feedback or share supplementary knowledge. PLNs are not passive; they only work when the learner has opportunities to receive specific and direct feedback and uses a network of peers or professionals to build upon the feedback if needed. Prior to the explosion in online content and tools, a PLN might have included an article from trusted daily newspaper or a print version of a child welfare journal that one photocopied to share with employees or colleagues. Today's PLNs benefit from numerous social media platforms that one can use to collect information related to professional interests, to share this information with others, and to collaborate with others on projects. Incorporating social media into one's PLN requires digital literacy and builds upon the theory of connected learning (Belshaw, 2014; Ito et al., 2013). Digital literacy means that the learner can use digital tools to judge the quality sources of information, evaluate what is shared, and sort out what is and is not useful. Materials are shared in a way that reflects professionalism and ethics associated with social work. Connected learning refers to the ways that information is exchanged within a network. One must know how to communicate across digital networks (the norms associated with the various tools and how to find people and add them to their network), assess who belongs in their network, and be self-motivated in information seeking in a group of colearners. In summary, you want to be professional, build a network of quality peer learners, and be a good peer learner by giving and receiving quality information in equal parts. Elise Johnson, LCSW, a clinical social worker at Long Beach Memorial Medical Center/Miller Children's and Women's Hospital of Long Beach, notes that her vibrant PLN enables her to maintain a connection with academics and other thought leaders in social work-related spaces. In turn, she is able to share her clinical expertise and practice lens with researchers. Her primary PLN exists via her Twitter network. She says, "many of the individuals that I follow on social media are social work researchers who post their publications on Twitter as well as academic journals. Others post resources and links that bridge worlds that I may not otherwise have known about. In some cases, I connect with those leaders and develop a bidirectional communication. I find that my clinical experience is welcomed by these individuals who are committed to collaboration that benefits clients and patients." • First, you can develop a network of trusted resources (individuals, organizations, and publishers) that you can access at almost any time. While learning from other professionals is nothing new, social media expands the number and variety of content, people and groups that you can access such as professionals from other countries, open-access peer-reviewed scholarship, and firsthand accounts of other people's experiences. Because social media platforms are available 24/7, you can connect with your network when you want and from most any digital device including a laptop, tablet, or smartphone. • Second, you can easily stay up to date on any professional interest and quickly add or expand an interest on your network. For example, if you are interested in homelessness, you might start by following local and national housing advocacy agencies on Twitter and, in the process, you might discover individuals who are tweeting about their personal experiences with homelessness. • Third, a digital PLN allows you to easily create and share content with others in real time, offering tools that enable you to meaningfully contribute to professional conversations and public discourse. Maybe you do not want to write a blog, but you can share an interesting article and photos with your colleagues about self-care practices or other professional interests via a Facebook group. The first step is to have a game plan. Professionals do not go to a job interview without knowing why they want the job. Similarly, you should know what you want to get out of your PLN. Are you looking to learn more about school social work, for instance, and hoping to connect with other school social workers and advocacy agencies? Do you want to develop specific kinds of skills? What do you have to offer, and how are you going to feedback information to your network that is also helpful to them? For instance, because of our (the authors') interests in technology and social work, we each have a Google Alert (a web-based tool that delivers content via e-mail based upon a keyword search) set up that searches new news related to the keywords "social work" and "technology" that automatically e-mails news stories. We can then share these stories with our social networks so we are bringing value to our conversations. We can also share information from our unique personal perspectives on content as social work educators. Sean Erreger, LCSW, MSW, author of the Stuck on Social Work blog, incorporates learning from other professional fields into his PLN. "I try to learn from other disciplines and industries that might help social work. Conversely, I engage with other industries that might not know about social work practice," he says. In these ways, he extends his network beyond social work, bringing in content from other professions and building interdisciplinary collaborations. He is especially interested in technology related to health care, and his social media network includes doctors and other health professionals who are also interested in this topic. The second step is building your PLN. Start by setting up a free social media account for professional use. You will want to create an open and public account. If you keep your accounts private, it will be difficult, if not impossible, to network, communicate, or share information with others. Remember that with a professional account, you want to present your authentic self in the best way possible, but this should be separate from your personal account where you might share family photos or other personal information. Use your real name and a real photo. This is the equivalent of attending a face-to-face professional meeting, introducing yourself, and then distributing your business card. You'll be meeting people across the world, and they'll want to know a little bit about who you are before they connect with you. Johnson often clarifies with colleagues and students that she uses Twitter only for professional engagement. "My use is strictly professional, not personal. All of my Twitter contacts are individuals with whom I exchange professional information and resources," she says. This way, her students will not assume that she shares personal information on the network, and she also has an opportunity to model professional use of social media. It is important to learn about notification settings for each social media platform, which may include texts or e-mail alerts when new content is available. Use these settings to push content to you in a way that is most convenient for you. When you develop new connections, a relationship development and maintenance task is to respond when someone helps you or calls upon you for advice. • Start following social workers on Twitter. Set your account to public, add your picture, and write a brief profile description. Next, use the search function in Twitter to look for other social workers and topics of interest to evaluate the kinds of information shared, and start following those who appear to share good content that interests you. Twitter also has a list feature that allows you to create a directory of other users. Laurel Iverson Hitchcock, PhD, MPH, LICSW (@laurelhitchcock), has several lists associated with her Twitter account including a list of social work educators. Nancy J. Smyth, PhD (@njsmyth), dean of the School of Social Work at the University at Buffalo, has a list of more than 1,000 social workers who use Twitter. You can find these lists by going to their profiles and clicking on "Lists." • Set up your LinkedIn profile. Spend some time setting up your profile on LinkedIn, a professional networking tool, job search engine, and online résumé. Start connecting with other social workers, and explore the different groups on LinkedIn. Join and participate in some of the different social work groups such as NASW or the Association for Community Organizing and Social Administration. Alternatively, you could use Facebook instead of LinkedIn. Hitchcock prefers LinkedIn for professional work and keeps her Facebook account for personal interactions. • Join an online community. There are several good options for online social work communities. Google Plus and Facebook both host numerous open and closed social work groups. After setting up your account with either platform, search for a social work community or create your own community based on your interests. Some recommended online communities include Social Work and Technology on Google Plus, moderated by Jonathan Singer, PhD, LCSW, and author Melanie Sage, PhD, LICSW. 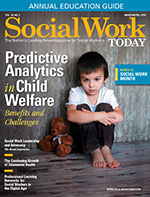 Erreger recommends the website SocialWorkr, which is new social network developed just for social workers. If joining a Facebook group, be sure your settings maintain your desired level of privacy so you do not mix your personal and professional lives. • Start reading social work blogs and websites. Start following, reading and commenting on social work blogs. Some of the authors' favorite social work blogs include Erreger's Stuck on Social Work (https://stuckonsocialwork.wordpress.com) and Social Work Career (www.socialwork.career) by Dorlee Michaeli, MBA, LMSW. Helpful websites include Social Work Helper (www.socialworkhelper.com) and Social Justice Solutions (www.socialjusticesolutions.org). Once you have set up your PLN, the next step is to maintain and nurture your network. People will follow and connect with you when you follow them, comment on their posts, and contribute valuable information. Relationships are key on social media. Plan to spend about 20 minutes a day reviewing content, sharing information, and interacting with other social workers. Examples include responding to someone's tweet, liking a post shared on LinkedIn, or posting a link to an interesting article on a Google Plus community. For Hitchcock, a typical day with her PLN includes checking Twitter (where she posts two or three tweets a day and responds to or retweets colleagues' tweets); sharing on LinkedIn (where she actively posts in a closed group with students about local job announcements and career building tips); and scanning e-mail for notifications and alerts from Google, blogs, journals, and other sources that she reads, and/or archiving information so she can review and share it later. Johnson values the ways that her PLN extends her learning and keeps her up to date on the latest discoveries in the field. Attending conferences in person is expensive, but she is able to follow what happens in conferences by following conference-specific hashtags, and also follow content related to conferences she may never have considered attending because they are outside her primary work focus. "While we gain from specializing in one area of practice, we may not always be aware of research and resources as they develop. We may also be missing out on innovative developments in areas of human service that are outside our area of direct practice if we do not maintain our PLN," she reminds us. If you want to take your PLN to the gold star level, activate your PLN when you have a question or learning need by actively reaching out to others. Tweet a question to select peers or invite others to collaborate on project. If you have a situation at work and need more information, ask other experts on social media. (Remember good social media ethics include never asking a question that could identify any clients, and don't ever "vent" about your work in a way that disparages our discipline.) Hitchcock likes to activate her network while attending professional conferences by sharing information that she is learning and crediting people who are providing the information. Using Twitter and the conference's hashtag, she post tweets from sessions that she attends and follows the tweets from peers who attend other sessions. Not only does she learn about what is happening in different sessions but she also can connect with new colleagues on site at the conference, and work with others to create an archive of the tweets that benefit people who cannot be there. Sage likes to use her Twitter network to stay connected to indigenous child welfare issues. She researches Indian Child Welfare Act compliance, but many of the other people who work in this arena are not social workers; they are lawyers, indigenous community leaders, and people who have personal experiences related to the topic. The people she follows post information about latest court findings, cultural understandings, and best practices. She also follows people who post about indigenous issues in other countries, such as Canada and New Zealand, and the international perspective helps inform her work and provides a community of people who she can reach out to for questions or advice. Online comments often eventually move to private chats, phone calls, or in-person relationships. If you are a social work educator or supervisor, not only should you develop your own PLN, but we would also suggest helping students or supervisees develop their PLNs. Part of your job as an educator or supervisor is to support other social workers as lifelong learners. PLNs are free resources where practitioners can stay up to date on information far ahead of the time it will ever reach a textbook. Students need your support in deciding how to make quality decisions about who belongs in their networks so that they receive and share trustworthy information. Education researcher and a public scholar of digital culture Howard Rheingold (2014) calls this assessment skill about what to share, consume, and whom to share with "crap detection," and it's an important one for social workers. Molly Beestrum, MLIS, a library instructor at Dominican University in Illinois, made "crap" into an acronym: Currency (current information), Reliability, Authority (who is the creator/publisher), and Purpose/Point of View. Consider these facets when evaluating your PLNs to help make decisions about who should be included in or excluded from your network. Finally, remember that social work is relational and PLNs are relational too. You never know what your online social connections will bring to your life. The authors, who met through our shared PLNs, have developed close collaborations and friendship, which has extended to copresentations, shared authorship, and days on the town. Our professional and personal lives are enriched deeply by these connections. — Melanie Sage, PhD, LICSW, is an assistant professor of social work at the University at Buffalo. Belshaw, D. (2014). The essential elements of digital literacies. Retrieved from http://digitalliteraci.es/. Council on Social Work Education. (2015). 2015 educational policy and accreditation standards for baccalaureate and master's social work programs. Retrieved from https://www.cswe.org/getattachment/Accreditation/Accreditation-Process/2015-EPAS/2015EPAS_Web_FINAL.pdf.aspx. Ito, M., Soep, E., Kligler-Vilenchik, N., Shresthova, S., Gamber-Thompson, L., & Zimmerman, A. (2015). Learning connected civics: Narratives, practices, infrastructures. Curriculum Inquiry, 45(1), 10-29. National Association of Social Workers. (2018). Code of ethics of the National Association of Social Workers. Retrieved from https://www.socialworkers.org/About/Ethics/Code-of-Ethics/Code-of-Ethics-English. Rheingold, H. (2014). Net smart: how to thrive online. Cambridge, MA: The MIT Press. Richardson, W., & Mancabelli, R. (2011). Personal learning networks: Using the power of connections to transform education. Bloomington, IN: Solution Tree Press.